If you are set on the look of a real wood roof for your new home, but don’t want to deal with the downsides including difficult and costly installation, potential rotting, repairing curling and cracking, dealing with mould, and replacing discolored tiles, we’ve got the answer for you. 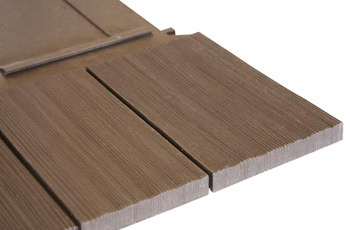 Euroshake Taper-Sawn or Hand-Split style rubber roofs are virtually indistinguishable from real wood. And they offer a multitude of benefits over wood roof shingles. Whether you want a wavy, source surface or a more subtle look with shallow ridges, you’ll get it with a Euroshake roof. And, as with all Euroshield roofs, you’ll be getting an environmentally-friendly product containing up to 95% post-consumer recycled materials. We are proud to be a Euroshield Certified Contractor. If you aren’t working with a certified roofer, you could end up with a roof that doesn’t meet the specifications needed to maintain your warranty. Properly installing vent pipes, using the panel locking system correctly, and ensuring correct pitch, are just a few of the things that a certified professional will know how to do that a contractor without a thorough understanding of rubber roof installation may not. Give Golden West Exteriors in Edmonton a call. We’ve certified experts. And, we’ve been installing rubber, cedar, metal, asphalt and a myriad of other roof types in Alberta for more than a decade. You can depend on us for outstanding customer service, excellent craftsmanship, and responsiveness during the installation process and after. Schedule an in-home consultation. Let’s discuss your project, your preferences, and review all of your options. We look forward to working with you.